This year mother nature was the typical woman that just couldn't seem to make up her mind. Winter, summer, snow, rain, and it finally took it's toll on me and this past week I've spent in bed with the flu. I figured I would revisit a previous post from 2012 that you might have missed. 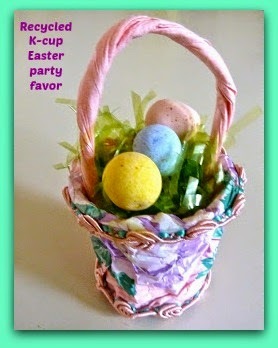 Recycling is one of my favorite crafts, and this one is practically free and makes a great Easter party favor. Note: You can also try substituting the twisted paper with textured or printed scrapbook paper and chenille stem handles. Stay tuned new tutorials coming soon. Very cute basket. Love that you are recycling from things you tend to use a lot. Thanks for sharing with Countdown in Style.